George Rodrigue has painted several versions of the Blues Brothers since 1995. 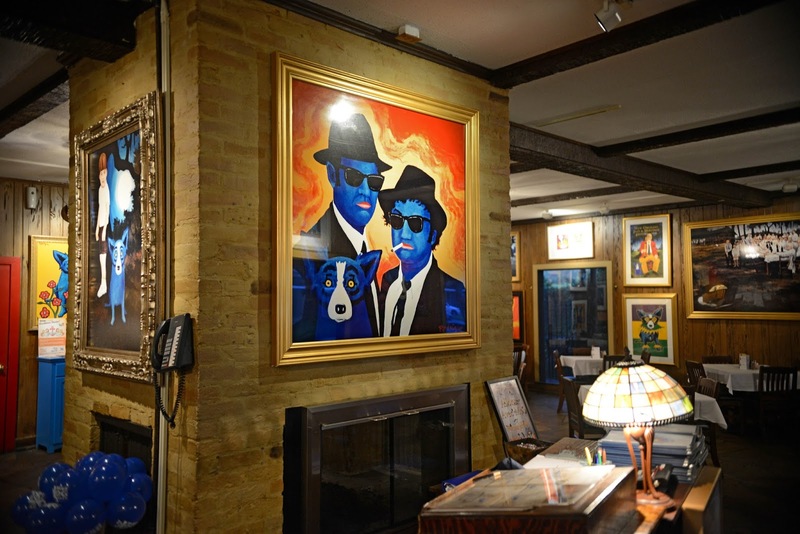 Although all in private collections, the paintings from this series are among his most popular, famous within the pages of art books and as reproductions on the walls of the Blue Dog Café in Lafayette, Louisiana and Besh Steakhouse at Harrah’s Casino in New Orleans. 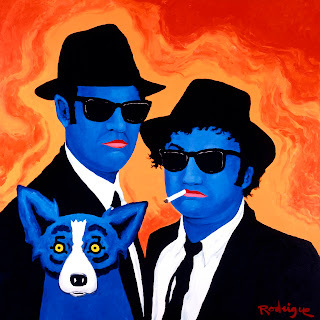 “The Blues Brothers connection with the Blue Dog was a natural for me,” explains Rodrigue, “and I had fun, from idea to execution, painting their faces blue with the Blue Dog." 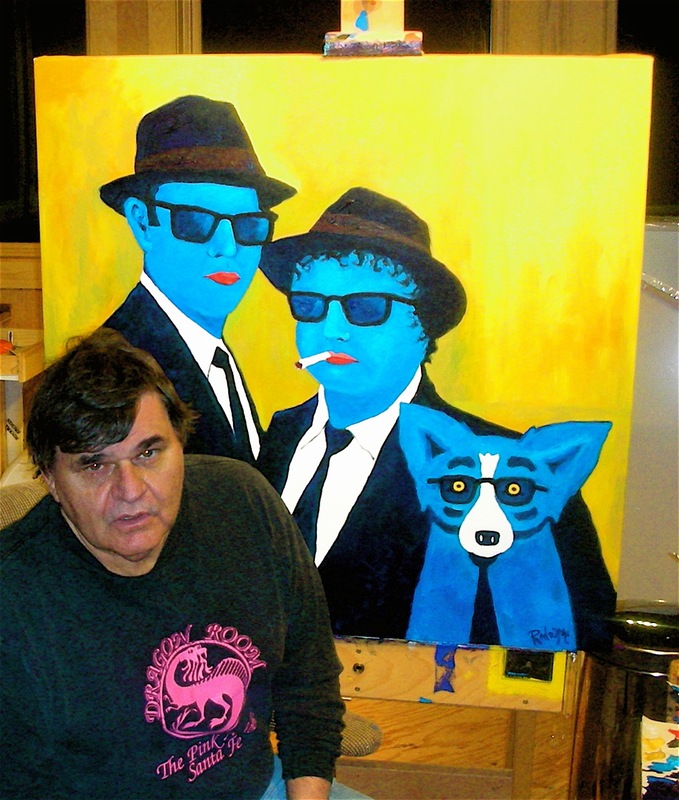 In Rodrigue’s typical style, the Blue Dog is eye-level, like a person. The figures are locked into a strong design, forming interesting shapes in the negative spaces. The colors are bold, with little left of the original loup-garou inspiration. 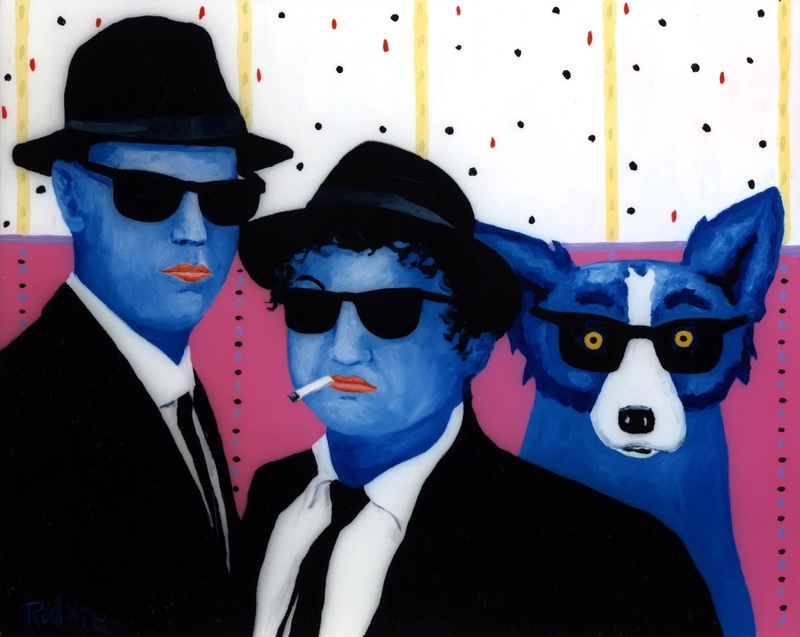 As with most of his original paintings, Rodrigue did not make prints* of the Blues Brothers series. 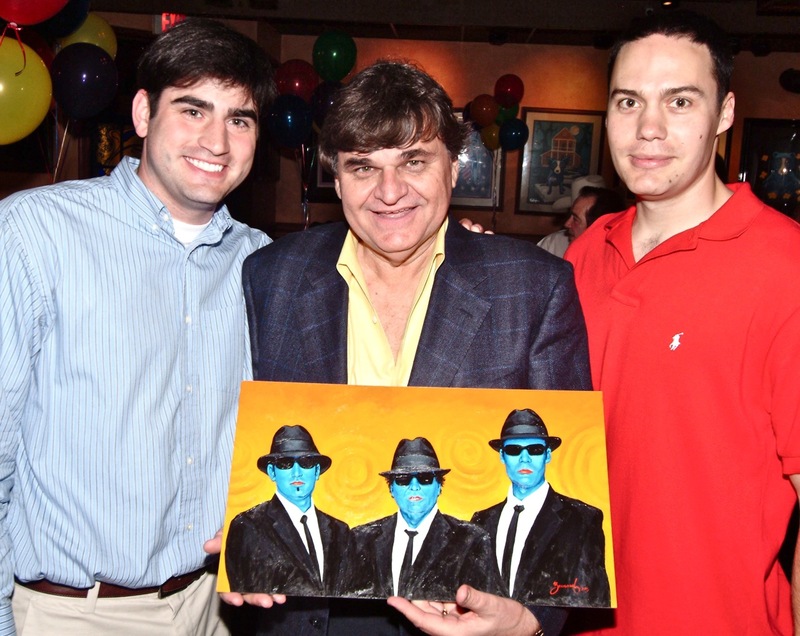 He did, however, create two large-scale copies for himself, both on loan to restaurants. In 2004, in honor of his 60th birthday, Rodrigue carried the concept into real life when he joined his sons, André and Jacques, in a Blues Brothers performance during his costume party. 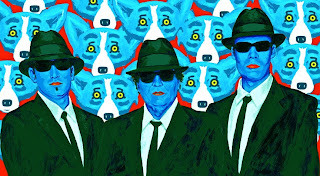 “We surprised the crowd,” recalls George, “when we changed from our Elvis and King costumes into Blues Brothers outfits. Before emerging from the back room for our performance, I even shaved off my beard! “‘It looks like ya’ll might have practiced for this,’ said my cousin Catherine. 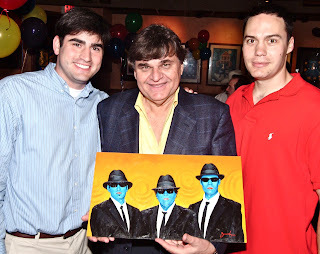 Following the show, George’s long-time friend, artist Tony Bernard, joined in the fun, with a painted gift for the Rodrigue boys. Still high on this experience with his sons, George could not resist creating his own version as well, incorporating the Blue Dog with Tony's portraits into a one-of-a-kind piece for his personal collection. Appropriately titled, It Runs in the Family, this 2005 artwork pays tribute to a father's close relationship with his sons. 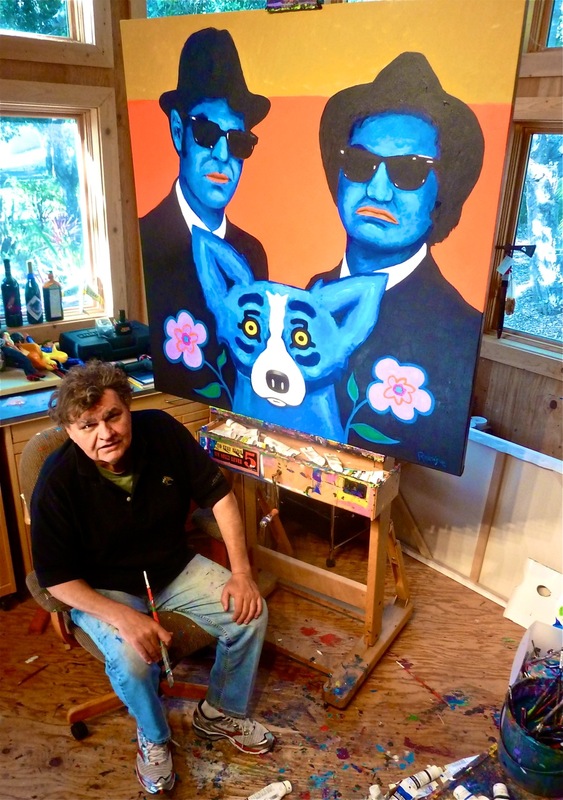 Although neither of these blue brothers became an artist, you'll find André most days at the Blue Dog Café and Jacques at the George Rodrigue Foundation of the Arts, where they each pursue, in their own way, a family's legacy. They can really get down!